PHILIPSBURG — St. Maarten Medical Center (SMMC) has been notified by Italian construction company INSO that its parent company, Condotte d’Acqua (Condotte) has filed for Extraordinary Administration, which is a restructuring procedure aimed at satisfying the creditors on the one side and safeguarding the continuity of the business and the employees’ rights on the other. Condotte’s going through financial turbulence was mentioned by several speakers, including Minister of VSA Emil Lee and SMMC’s General Director Kees Klarenbeek, during yesterday’s Groundbreaking Ceremony for the construction of the new hospital. Despite these current circumstances, Tripartite members Ministry of VSA, SZV and SMMC have confidence that the project is properly insulated from any financial shocks, thereby safeguarding the SMMC, its lenders and the country of St. Maarten. Until clarity is established, no money will be transferred to INSO by SMMC by its own initiative, that of Minister of VSA, and the lenders, which includes the SZV. This may result in a slight delay on the timetable. INSO, the lenders to the SMMC and the World Bank have been in positive cooperation towards reviewing the current financial safeguards of the project, the objective being to ensure a successful start and quality completion of the new hospital. “In 2016, SMMC contracted INSO as the general contractor to design, build and maintain the new hospital. We value the professionalism of the international company INSO. 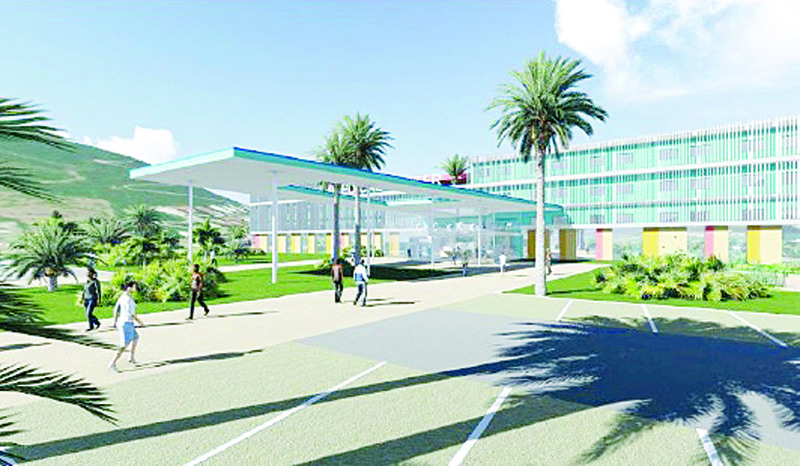 Sufficient financial safeguards are in place in the business plan of the new hospital project. SMMC ensures that payments will only be made when construction works are indeed completed at each stage, after proper verification by SMMC’s contracted engineering firm. This arrangement protects the lenders of the project as well”, Kees Klarenbeek stated. Condotte is a construction company that is active since 1880 with a current annual turnover of 1.3 billion euros. The company is going through financial turbulence due to the crisis that has affected the Italian construction business in general in recent months. Condotte, is embroiled in disputes with Italian state entities over expenses from carrying out public works and has filed for protection. As a result of the extraordinary administration measure, the courts have appointed an administrator, headed by Gianluca Lucisano, a former officer of the Guardia di Finanza with the role to protect INSO. SMMC is working with the administrator to ensure that the new hospital project can proceed without any risk. The New Hospital project managers have been in contact with the Italian administrator, to ensure the project can move forward with clarity and surety. “In the continued manner of upholding transparency and integrity concerning the new hospital project, it should be noted that the Condotte administrator has yet to make a decision on the way forward for INSO, and it is likely to either sell INSO as a healthy going concern, or to use the good company of INSO and its also profitable hospital maintenance company SOF, as part of a restructured Condotte. Various options are weighed to ensure the safety of our healthcare and our country’s investments, which includes the use of the World Bank Trust Fund set up by the Netherlands and overseen by the Minister on behalf of Government”, concluded Interim CEO of SZV Glen Carty. The group, which is currently among Italy’s largest, has a field of action extending to other geographical regions: Europe, North and South America, Asia and Africa. It was December 1st, 1997 when Ferrocemento – Costruzioni e Lavori Pubblici SpA acquired both Gambogi Costruzioni SpA. and Recchi Costruzioni SpA. This was a crucial step towards its success on the increasingly competitive international construction market. Thus, following this path, the group achieved further integration. On August 1st, 1999, a new company was born from the conveyance of Ferrocemento’s Public and Private Works arm to Condotte. The name for the new company was based on that of the oldest one: Società Italiana per Condotte d’Acqua SpA. Ferfina SpA retained its position at the head of the group, acting both as the holding company and the financing company. In the following years, under the guidance of the Holding Company, the group grew furthermore, also thanks to the acquisitions of Cossi Costruzioni from Sondrio and of Inso from Florence.